Fall means pheasant hunting season in much of the country. Among the most sought-after game birds, the ring-necked pheasant isn't an American native. These birds were imported to North America in the late 19th century. 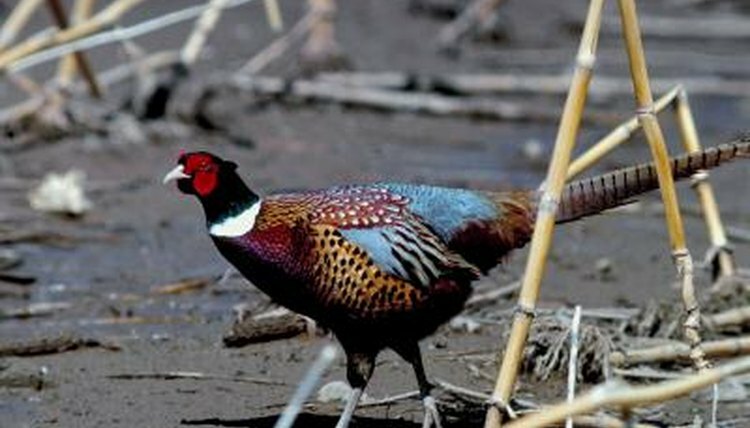 Since wild pheasant stock fluctuates depending on weather and habitat suitability, private organizations and individuals raise these wild game birds for release in the autumn to ensure an adequate supply for sport. Before purchasing pheasant chicks or adults, check with your state's appropriate hunting and wildlife management agency. Some states require permits or licenses to raise game birds, while others, such as New York, run programs providing day-old chicks for raising by approved participants. State law also regulates where the birds may be released. In Wisconsin, those receiving chicks from the state program must release the adult birds on state-owned land or private lands open to hunting by the public. If participants want to release pheasants on private lands not open to the public, Wisconsin law requires that a certain percentage of the birds raised are returned to the state for public land stocking. Give day-old ring-necked pheasant chicks unlimited access to a game bird starter feed, available at most feed supply stores. Don't substitute chicken starter feeds, as game bird starters contains higher amounts of protein necessary for pheasant chicks. At the age of 1 week, start switching chicks to a game bird grower product. Continue feeding the grower until the birds reach 4 months. At that age, transition your birds to standard game bird feed. If you're raising ring-necks from eggs, start feeding hens a game bird layer ration about three weeks prior to the start of egg laying. Hens sit on eggs for about 25 days. Continue feeding hens layer ration for the period of egg laying and chick brooding. You can raise young ring-necked pheasants in coops, the same as those used for domestic chickens. Once the juvenile pheasants are about 6 weeks old, let them into flyways, adjacent to the coop. The North Dakota State University website recommends constructing flyways with chicken wire on the side walls and nylon netting on the top. Bury the chicken wire between 6 to 12 inches to keep predators from digging under. The flyway structures should be about 7 feet tall and 20 feet wide. You can shade part of the flyway's roof netting with burlap or a similar fabric. Pheasants need cover in the flyway, so provide bales of hay or straw for hiding. Hens can also use these bales for nesting and egg-laying purposes. Shortly before hunting season begins in your state, you'll round up your ring-necked pheasants for release on game lands. For easier catching, round the birds into an enclosed pen the night before, supplying them with sufficient food and water. Pheasants are put into crates and transported to the release location. Birds shipped for hunting are generally between the ages of 19 to 23 weeks.